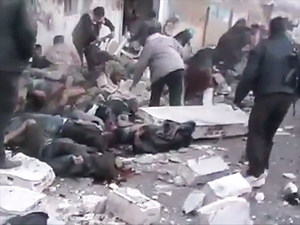 It was reported as a bakery serving the hungry citizens of Halfaya (near Hama) that was bombed December 23, 2012. This attack killed many people, with dozens of bodies in often-horrific condition shown on video. Opposition reports claim that nearly 100, over 100, up to 200, and even "at least 300 people were killed," most or all of them civilians waiting in line for bread. It has been blamed on bombing by warplanes, as part of a mad Syrian government policy of starving its rebellious people into submission. But as usual, there are reasons to doubt that. The nature of the bombing victims: hundreds of civilians ? Dozens of fighters ? The nature of the bombing damage: How many attacks of what kind? The nature of the building(s) impacted: a bakery, rebel base, or what? How do opposition descriptions line-up with video recordings? It's in the details of just what happened that the best clues can be found about the parties responsible for just what happened. There are existing evidence-based critiques of the rebel story, which we will, as possible, consider and second-guess. There is and will be more to read on the discussion page. Halfaya is about 12 miles southwest of the small Alawite town of Maan, which was attacked and overrun by rebel fighters on December 24. "Jihadists" took "large parts" of the tiny town with the rest perhaps remaining under control of "Shabiha" (Maybe holed up with Alawite hostages ala the Aqrab incident? - perhaps. See Maan Massacre). "Alongside other radical Islamist groups, al-Nusra Front seized parts of the village of Maan, said the Syrian Observatory for Human Rights," in fighting that killed 20 government troops and 11 rebels. 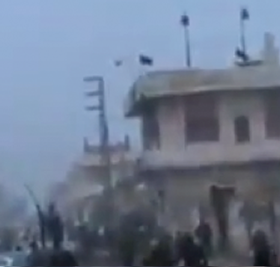 Al-Nusra Front appears to be at the forefront of the conquest of Halfaya as well (see below, "The Flag") This is all rather troubling. It's also quite near the site of the Mazraat al-Qubeir massacre of June 2012, a few kilometers to the southwest. That might not mean anything, however, the regional power hub at Mahrada dam, right between the twin cities, is clearly of interest to rebel conquerors as well. Perhaps they can defuse tensions be deciding the shells came from the dam, and seize that property instead. And then hit Mahrada later. 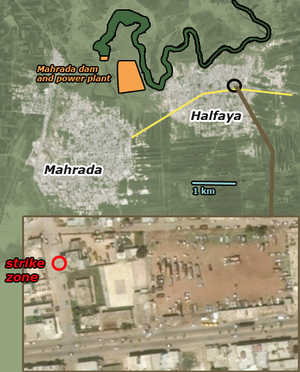 It seems the power station is its own targetof some value, and was reportedly attacked on December 18, just about as Halfaya was taken. As the widely-banned Syrian Arab News Agency (SANA - found via the proxy Syria-SANA.com): "...an armed terrorist group attacked last night the high-voltage power transmission network in Halfaya town in Hama countryside which supplies Hama city and Aleppo province with electricity from Mhardeh station. The electrical grid went out of service due to the terrorist attack." Again on Wednesday the 26th, SANA reported, Halfaya rebels moved on the power plant, "stormed it and sabotaged high voltage towers." They suffered high casualties, it was reported, but effectively won, decisively taking out power to the whole area in the dead of winter, and even to the major city Hama, 12 miles southeast. Repairs are surely planned, but work will clearly be difficult unless Halfaya is cleared. Back to the alleged bakery bombing: The location within Halfaya where that happened can be identified, if with a bit less certainty than usual. It's in the east central part of town, just off the main road. The building that was nearly hit is likely the one dead-centered here on Google Maps, and show in the map above. Being filmed after sunset (17:26 local time), sunlight angles are no help here. But the immediate surroundings (buildings vs. walled areas, etc.) all match, as does the line-up between the power pole just north of the building and the minaret of a mosque some distance NNE of there. Most videos seem to move north to the stricken area from somewhere south, one visibly crossing the city's divided main street on the way, solidifying the locale. Note that the building is extremely near a semi-truck parking area, a cargo distribution point. It's a good locale for handing out delivered food, and possibly for baking it fresh with supplies that could be in the back door in a flash. Wikimapia has years-old and possibly outdated labels attached to this area. One entry lumps our "bakery" with the building next door, under a label translating "Municipality and Halfaya clinic." The other building seems more visually well-suited to minor medical use. Another shows an area across the truck lot labeled "Fruit and vegetable market." Non-expert assessment by wiki member Caustic Logic (with more detail and visual supports forthcoming): The physical evidence suggests an explosive artillery or mortar shell fired from a more-or-less westerly direction, or as was reported, a fighter-jet fired rocket on that line. The former might fit better with the relatively little horizontal movement seen. A rocket would tend to cruise right into the building, but the killer here almost seems to have plunked down into that small crater by the sidewalk and skidded just a bit, tossing and pushing dirt and bodies against the wall and right through the metal shutters. See the first image in the gallery below; the basic trajectory was followed, but not enthusiastically. The white masonry inside and around the crater clearly fell in after, from the upper floor balcony wall. Whether it fell from the sheer shock of impact, or was perhaps hit by its own shot (see the circled are in the fourth image). There was apparently quite a fireball. The building's facade is partly scorched, and some people are burned to pretty extreme degrees, some with their clothing blasted or burnt almost completely away. The scattered parts further from the site would have been those most violently blasted, hurled in chunks against the wall, and bouncing some yards back. If this only proven hit were from artillery after all, rebels would say it came from Mahrada, which they now threaten for harboring forces that attack them. But in reality it could be from the west side of rebel-held Halfaya too, if it were a false-flag attack to justify, for example, an attack on the Christians next door. The FSA more than likely has a number of artillery pieces under their belt by this time, and have always had plenty of mortars. While rebel fighters were killed, Islamo-nihilists (like Jabhat Al-Nusra, who are based here, see below) would likely have no problem sacrificing a few of their own - especially expendable foreigners - if just for grim realism of it. Looking closer, there are some signs of previous hits on this building. Some of the blast pattern lines seem to have different centers than the main hit thatleft the crater. One window to the left seems to have been holed, with some sort of half-blast there, and there's a curious hole right above and to the left of the loading door. This is shown in the third image below. (also, some peculiar marks on the upper balcony highlighted, in case they matter). This revised total of 45-58 - still based on a provided list of names that may or may not even be real - is much closer than the more prominent reports to what can be seen on video. 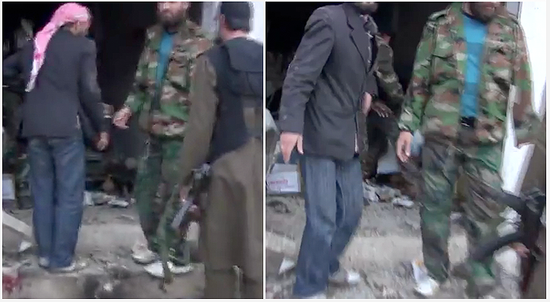 This horror show at the "bakery" is the one and only scene activists have shared of any Halfaya attack. There are something like two dozen people about who seem dead, or perhaps more than 30, considering those buried under others or in the small amount of rubble, and those of whom only scraps remain. So just what the shrill headlines of up to 300-plus victims were ever based on, it appears to lie outside the world of facts. Among the piled bodies seen in the videos, some are clearly alive, and others perhaps less-clearly so. But the majority seem to be deceased. some massively so. There are a few victims blown fully into pieces, and others with no clear injury. Some have much of their clothing blasted away, but most have clear signs of clothing suggesting a majority of those seen down and dead are rebel fighters. Several wear red-and-white checked Islamist khaffiyehs on their heads, like the men scooping up their remains. Others wear camouflage jackets of "army defectors." Some have beards. Two young men on motorbikes, at least, were knocked over (one at least alive). The critics of the rebel story so far have noticed at least one or two women present in the rubble. There seem to be in fact three or more, with some victims rendered unclear. (details forthcoming) There are other women mostly in the proper hijabs or at least head scarves for areas under rebel control, seen walking away from the scene. The middle composite view below shows at least four of them who apparently were at the site, but survived and are walking away to main street. There may be a little girl in a purple hijab, perhaps injured or even dead, on the sidewalk a little closer to the blast, as seen in the first (left) image below. A woman, perhaps her mother, seems to be pleading with a rebel fighter for help with either the girl or with someone else even worse off. Besides queuing for food, there are other reasons a small number of civilians might be at this building, depending what it really was. But there are too many unknowns to put forth any specific alternative guess. What might be on interest is how many people were there. Reuters reported: "Activists said more than a thousand people had been queuing at the bakery." But the number of civilians in the strike zone is remarkably low. Fairly dense grouping is suggested, of primarily fighters. What might be suggested is a poorly-attended bread line the rebels tried to flesh out with themselves. Perhaps many locals were just not hungry enough to take Al-Nusrah bread (see below), even if it was handed out for free (and it was likely far from that). As noted above, the location is at a cargo center where big trucks arrive in town from the east, along with the numerous things that can be loaded into them. Everything about this area says it's rebel-controlled, and the rebels there do claim to have just taken general control of Halfaya. Any bakery or shipped food hubwould be overseen and policed by rebels. It's therefore not unusual to see one of their flags atop this place, whatever it truly was. But just which flag is of some interest. In at least two videos, the person filming is forced bacwkard away from the scene by rebel helpers. They work in teams of two or more, wildly engaging the camera, shouting, flailing their arms maniacally, while walking further from the building. (citations coming) It does complicate a clear view of some things, like the flag atop the building. But enough frames come through to establish it as apparently nothing but black. It's not the French colonial rebel flag they like to show the West. Seen closer, it would likely have white writing or symbols on it, clarifying whether it's an old-fashioned pirate flag, or the flag of Al Qaeda in Iraq and/or Jabhat Al-Nusra. The best view yet is from some distance, as shown at right (source video). Among the people who seem the most calm and the least shocked are two men we can see meeting as the blast center in video C3 as listed here (see talk page), around the 3:50 mark. The man on the left sports a beard and a red-and-white khaffiyeh (headscarf) and an unusual thing here - a dusty dark-blue Western-style business jacket. Trucks were arriving here, and bread was reportedly being distributed. Food is often sold by rebels, it's reported, and not always cheaply. This could be a rebel businessman, easy to spot in a crowd like this - perhaps the recently-appointed manager of this "bakery." He's assessing the damage, and conferring with a bearded, older militant in camouflage. They have at least one armed and alert guy standing with them, but this fighter, like the businessman, is unarmed, in more ways than one. His left arm is apparently missing, leaving his sleeve hanging empty. Should be easy to identify a one-armed militant commander with about that chin, if it weren't 30-some countries these "Syrian people" now hail from one would have to comb for a match. They walk away as soon as the notice this camera looking their way. CNN reported based on skype testimony by activist Alawy Al-Rajb. The town has lacked the ingredients for bread for about a week until an aid group delivered provisions Saturday, Alawy said. Hundreds of people lined up at the bakery on Sunday. Al-Rajb said the town has three bakeries, and one opened at 1 p.m. Workers began to distribute the bread two hours later. He was on his roof about 200 meters (about 219 yards) from the bakery about 4 p.m. and saw a plane overhead. He scrambled toward the scene when he heard cries of "Emergency! Emergency!" he said. "The first floor collapsed on the second floor, and four rockets were fired into it," he said of the attack. Scores of people who had been without bread for days were killed when Syrian warplanes bombed a bakery in the western village of Halfaya, opposition activists said Sunday. About an hour after the bakery attack, 15 shells were fired into Halfaya from a nearby town, Al-Rajb said. This page was last edited on 19 August 2013, at 11:39.